Bitcoin and other cryptocurrencies gained slightly Monday afternoon as the Dow Jones Industrial Average plummeted more than 1,500 points. Cryptocurrencies got whacked alongside equities last week, but Monday’s continuation of the stock market selloff appeared to send some investors to digital currencies in search of a safe haven. 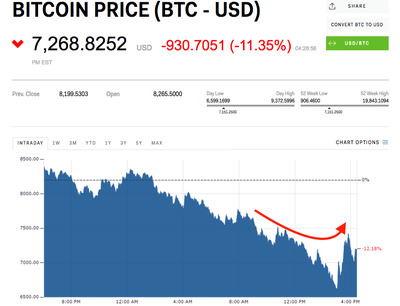 After heavy losses Monday morning, the tide began to turn for cryptocurrencies. Around 3 p.m. ET, when the Dow Jones industrial Average was seeing the worst of its 1,500 point selloff, the total market value of cryptocurrencies started to creep higher. The entire crypto market cap jumped 7% from its low of $US310 billion, to $US335 billion by 4 p.m. ET. 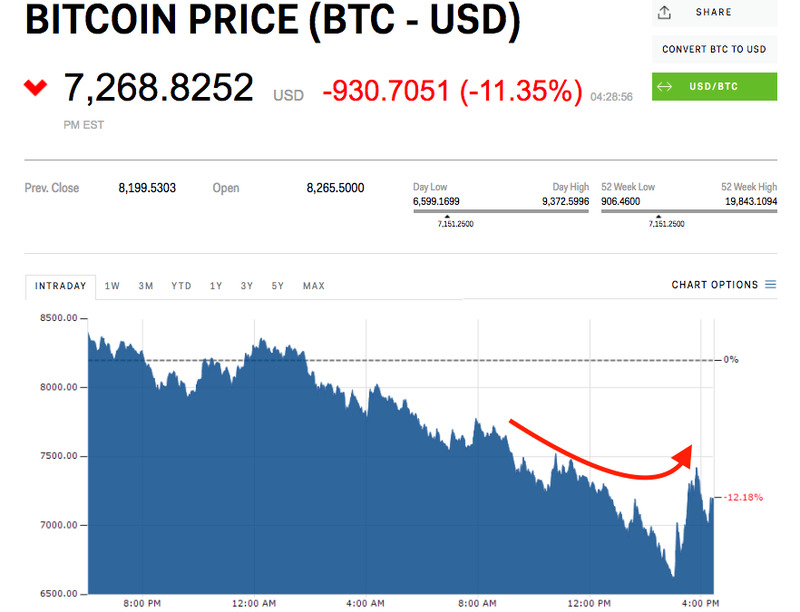 Bitcoin, the largest and most well-known cryptocurrency, was still down 14%, but had climbed 6% off its intraday low of less than $US6,600. Ethereum was up 12% off its low of $US627 to $US711, and Ripple’s XRP was up 11% from its low of $US0.64. 2018, in contrast, hasn’t been the same fairy tale for cryptocurrencies. Since January 1, the total market cap for virtual currencies has fallen by $US245.7 billion, or roughly 43%, thanks to fears of new regulations in Asian markets like China.